Acute lymphoblastic leukemia is the most common leukemia in children. There have been advancements in management of this disease, and still research is on to improve further outcome. A prospective observational study was conducted in a tertiary care hospital in north India from 2008 till 2013, enrolled 186 pediatric acute lymphoblastic leukemia patients. Aims: To see clinical profile of pediatric ALL patients, and to see correlation of day 8 and day 33 blast count with cytogenetic and its effect on overall survival of our patients. Methods: It was a hospital based observational prospective study. Patients were enrolled from June 2008 till March 2010, after risk stratification, patients received risk adopted BFM 95 protocol, last patient finished his maintenance on August 2013, and study was closed in November 2013. Results: Median age of presentation was 6.5 years and male to female ratio was 3.5:1. High risk disease was seen in 55.85% patients, Fluorescence In-Situ hybridization (FISH) for TEL AML, MLL, BCR-ABL gene rearrangements were positive in 33.3%, 9.1%, 9.7% patients respectively. Bone marrow was the commonest site of relapse. Day 8 peripheral blood blasts and day 33 bone marrow blasts had no significance as all the patients had complete clearance. So in our study the overall survival at 6 years of analysis was 86% and event free survival for the entire series was 82% at 6 years. Immunophenotypic and cytogenetic profile in pediatric acute lymphoblastic leukemia patients. Correlation of Cytogenetics and Immunophenotypic with day 8 peripheral blood blast counts and day 33 marrow remission status during induction phase 1. Correlation of Cytogenetics and Immunophenotypic with overall survival in our patient cohort. The study was a hospital based, observational study conducted between June 2008 to November 2013. The study included analysis of data of children in the age group of 1 to 18 years, diagnosed as acute lymphoblastic leukemia (ALL), who visited the Apollo Centre for Advanced Pediatrics, Indraprastha Apollo hospital during the study period for their treatment. All the cases of ALL below age of 1 year (infant ALL) and those who had already relapsed at the time they presented to our centre were excluded from the study. The data was collected from 186 patients regarding their age, gender, laboratory indices like hemoglobulin, leukocyte count, platelet count, CSF cytology (positive or negative for blasts), Immunophenotypic data (Pre B ALL, B cell ALL, T cell ALL) by flow cytometry, Cytogenetics data (hypodiploidy, normal, hypodiploidy) by conventional karyotyping method) and in a few patients Fluorescent In Situ Hybridization (F.I.S.H) technique was used to determine presence or absence of BCR-ABL, TEL AML, MLL gene rearrangements. In the 186 patients that opted for treatment the status of blasts in peripheral blood at day 8 and bone marrow status at day 33 was assessed to determine the response to therapy. The outcome in terms of survivor and non-survivor was determined. The last point of contact in survivors and non-survivors was recorded. All the patients were risk stratified and the treatment was modified accordingly. Treatment protocol used was modified BFM 95 protocol, and treatment was risk adopted, either standard or high risk. Analysis of disease outcome was examined as overall survival (OS) and event free survival (EFS). 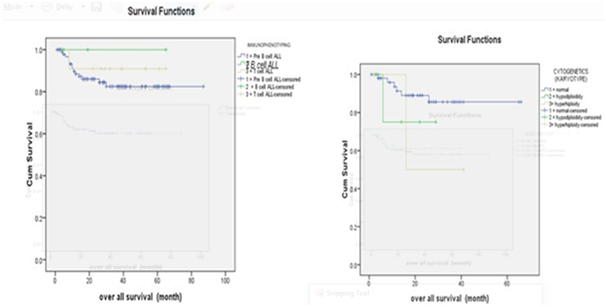 OS was measured from date of initial diagnosis of ALL to date of death from any cause or date of last contact using the Kaplan-Meier method which is a nonparametric (actuarial) technique for estimating time related events (the survivorship function). This study was prospective observational in nature. The first patient was enrolled in June 2008 and the last patient was enrolled in March 2010. All patients had completed the risk adopted protocol including maintenance, and last maintenance finished in August 2013. The data of 186 patients with ALL who visited our Centre during the study period revealed the following results. The age range of the study population varied between 1.5 to 15.8 years. The mean and the median age were 7.2 (±4.1) and 6.5 years respectively. Majority of patients (74.6%) patients were below 10 years (Figure 1A). There were 78.1% boys and 21.9% girls (Figure 1B). The male: female ratio was 3.5:1. Central nervous system disease at diagnosis was seen in only 4 patients and they all received cranial irradiation. The Total leukocyte count (TLC/µl) ranged between 600 to 7lakhs. The mean and the median TLC were 39000 and 8300 respectively. The TLC was more than 50000 in 23.7% patients (Figure 2A). The platelet count at presentation was less than 30.0×109/L in 18.4% patients, more than 30.0×109/L to 50.0×109/L in 50% patients and greater than 50×109/L in 31.6% patients (Figure 2B). Risk stratification of the patients has been done in this study into high risk, standard risk and treatment was modified accordingly, giving more intense therapy to the high risk patients. Patients having any one of the following criteria like Age >10 years, TLC >50,000/µl, CNS disease present at diagnosis, immuno phenotyping showing T cell ALL, cytogenetic analysis showing hypodiploidy or MLL gene rearrangement or BCR ABL arrangement was considered high risk and the rest as standard risk. Analysis revealed that 104 (55.85%) patients were high risk and the remaining 82(44.14%) patients were standard risk. The immune-phenotyping analysis revealed Pre B ALL in 88.6%, B cell ALL in 1.7% and T cell ALL in 9.7% patients (Figure 3A). Conventional cytogenetic revealed normal cytogenetics in 78%, hypodiploidy in 9.5%, hypodiploidy in 4.8%, and 7.5% failed to culture (Figure 3B). FISH for TEL AML, MLL, BCR-ABL gene rearrangement analysis was positive in 33.3%, 9.1%, 9.7% patients respectively, with 48% had no FISH available (Figure 4A-C). All the study patients received treatment. The treatment was risk stratified on the basis of few parameters listed above. We had high risk patients (56%) more than standard risk (44%). So, treatment was instituted as either high risk BFM 95 protocol or Standard risk BFM 95 protocol of the 186 patients who received therapy, the peripheral blood status at day 8 showed complete disappearance of blasts in all the patients. The bone marrow status at day 33 revealed complete remission in 184 patients since there were 2 induction deaths. The outcome of 186 patients revealed 161 survivors and 25 non survivors. Among the 25 non survivors, 17 patients had either relapsed or died, 7 patients died due to treatment related toxicity out of which 2 were induction deaths and 1 patient died in an accident. Bone marrow was the commonest site of relapse. So in our study day 8 peripheral blood blasts and day 33 bone marrow blasts had no significance as all the patients had complete clearance. So in our study the overall survival at 6 years of analysis was 86%. The overall survival (in months) of patient’s range was in the range of 1 month to 87 months with mean of 31.32 (±SD 20.5) and median of 28.00 (±3.8). The estimated mean survival time for the high risk and standard risk patients were 58.41±5.6 and 74.88±8.4 months respectively and this difference was not statistically significant(p=0.896) (Figure 5A). The estimated OS for the entire series at 6 years was 86%. The EFS for the entire series was 82% at 6 years (Figure 5B). The median survival time for males and that for females was similar and the difference was not statistically significant (p=0.267). The median survival time of the patients who had CNS disease at diagnosis was similar to those who did not and the difference was not statistically significance (p=0.351). The median survival for patients with TLC<50.0×109/L and for those with TLC>50.0×109/L was similar and was not statistically significant (p=.242). The difference in the median survival time for patients with Pre B ALL and T cell ALL was not statistically significant. The median survival time in patients, who had normal Cytogenetics, hypodiploidy and hypodiploidy were similar and this difference was statistically not significant. (p=.263). Among patients who got relapse, they belonged to all subsets, viz, Normal Cytogenetics, ABL- BCR, TEL- AMLor MLL abnormalities (Figure 6A) (Figure 6B). The survival difference was insignificant among these groups. Figure 1 (A) Around 25% patients above 10 years of age, and rests were below 10 years. (B) More than 2/3rd was boys and male to female ratio was 3.5:1. Figure 2 (A) TLC AT Diagnosis: 38% patients had total count less than 4000µl. (B) Platelets at diagnosis majority had more than 50000 µl. Figure 4 (A) Conventional Karyogram showing Conventional Karyogram showing t (4-11) in a patient. (B) MLL gene rearrangement by FISH in one of our patient. (C) BCR ABL positive by FISH in one of our patient. Figure 5 (A) Mean survival, the estimated mean survival was 75 (*5.6) months. (B) Mean survival as a function of age, the different in estimated OS in the 2 age groups was not statically significant (p*0.583). Figure 6 Overall survivals as a function of immune phenotype, higher in B cell patients, with no statistical significance. (B) Overall survival in months as per cytogenetic, higher in normal karyotype patients (58.47±5.6) with no statistical significance. In our study population Pre B ALL was seen in 88.6%, B cell ALL in 1.7% and T cell ALL in 9.7% patients. In our study we found that all the B cell ALL patients were alive at the time of analysis and the difference in outcome in terms of overall survival between Pre B cell ALL and T cell ALL was not statistically significant. In our study treatment was stratified with T cell ALL classified as high risk and receiving more intensified treatment. In the study by Goldberg et al.11 from the Dana Farber Cancer Institute (DFCI), analyzed the outcome of 125 patients with T cell ALL found no significant difference in EFS comparing patients with T-ALL and B-progenitor ALL , although T-ALL patients had significantly higher rates of induction failure, and central nervous system (CNS) relapse. In the COALL studies T-ALL had a similar prognosis as B-precursor ALL except in COALL-89, in which only a small number of patients was entered.12 In two studies by Chessells JM et al.13,14 T cell ALL was seen to have a worse prognosis and early relapse was more common in children with T-ALL. In a study by Horibe et al.13 found that incidence of T-cell ALL to be less as compared to those reported by Tokai and Hokkaido in Kansai and Chu-Shikoku. Patients with B-cell precursor (B-pre) ALL had a more favorable prognosis as compared to T-cell ALL patients.14 In the analysis of published data comparing the prognostic determinants in childhood ALL in Negroid and Caucasian population, Macharia WM15 found the proportions for T cell Immunophenotypic in developed countries and developing countries to be 17% and 60% respectively. In a study by Hussein et al.7 B-cell precursor phenotype was encountered in 73.4% of patients, T-cell in 26.6%. In our study, Conventional Cytogenetics revealed normal Cytogenetics in 78%, hypodiploidy in 9.5%, hypodiploidy in 4.8%, and 7.5% failed to culture (Figure 3B). The median survival time in patients, who had normal Cytogenetics, hypodiploidy and hypodiploidy were similar and this difference was statistically not significant (p=.263). The study has evaluated the survival outcome in children with ALL and has determined the prognostic factors like Immunophenotypic, Cytogenetics in addition to conventional factors associated with adverse outcome and survival rates in a large cohort of patients in the Indian population. The study clearly shows that the prevalence of adverse prognostic factors is not very high in the Indian population as had been previously reported in various Indian studies. The results and outcome of this study have been compared with the results from the previous studies from India and those from the developed countries. This study clearly shows that with appropriate risk stratification of patients with adverse prognostic factors and treatment modification accordingly we can get the outcomes in our setting which is comparable to that in the western world. Pui CH, Evans WE. Acute lymphoblastic leukemia. N Engl J Med. 1998;339(9):605–615. Gaynon PS. Childhood acute lymphoblastic leukemia and relapse. Br J Haematol. 2005;131(5):579–587. Chessells JM, Hardisty RM, Richards S. Long survival in childhood lymphoblastic leukaemia. Br J Cancer. 1987;55:315–319. Shanta V, Maitreyan V, Sagar TG, et al. Prognostic variables and survival in pediatric acute lymphoblastic leukemias: Cancer Institute experience. Pediatr Hematol Oncol. 1996;13(3):205–216. Vaidya SJ, Advani SH, Pai SK, et al. Survival of childhood acute lymphoblastic leukemia: results of therapy at Tata Memorial Hospital, Bombay, India. Leuk Lymphoma. 1996;20(3-4):311–315. Magrath I, Shanta V, Advani S, et al. Treatment of acute lymphoblastic leukaemia in countries with limited resources; lessons from use of a single protocol in India over a twenty year period. Eur J Cancer. 2005;41(1):1570–1583. Secker-Walker LM, Chessells JM, Stewart EL, et al. Chromosomes and other prognostic factors in acute lymphoblastic leukaemia: a long-term follow-up. Br J Haematol. 1989;72(3):336–342. PadmanjaIi KS, Gupta S, Tomar S, et al. Relapse pattern of acute lymphoblastic leukemia in children treated on an uniform regimen and analysis of risk factors. Indian JPedia tr. 2002;69:S2–S8. Amare P, Gladstone B, Varghese C, et al. Clinical significance of cytogenetic findings at diagnosis and in remission in childhood and adult acute lymphoblastic leukemia: experience from India. Cancer Genet Cytogenet. 1999;110(1):44–53. Goldberg JM, Silverman LB, Levy DE. Childhood T-cell acute lymphoblastic leukemia: the Dana-Farber Cancer Institute acute lymphoblastic leukemia consortium experience. J Clin Oncol. 2003;21(9):3616–3622. Harms DO, Janka-Schaub GE. Co-operative study group for childhood acute lymphoblastic leukemia (COALL): long-term follow-up of trials 82, 85, 89 and 92. Leukemia. 14(2):2234–2239. Chessells JM, Veys P, Kempski H, et al. Long-term follow-up of relapsed childhood acute lymphoblastic leukaemia. Br J Haematol. 2003;123(3):396–405. Horibe K, Hara J, Yagi K, et al. Prognostic factors in childhood acute lymphoblastic leukemia in Japan. Int J Hematol. 2000;72(1):61–68. Macharia WM. Comparison of prognostic determinants in childhood acute lymphoblastic leukemia in Negroid and Caucasian populations. East Afr Med J. 1996;73(10):638–642. Tsang KS, Li CK, Chik KW, et al. TEL/AML1 rearrangement and the prognostic significance in childhood acute lymphoblastic leukemia in hong kong. American Journal of Hematology. 2001;68(2):91–98. Sugapriya D, Preethi S, Shanthi P, et al, BCR-ABL translocation in pediatric acute lymphoblastic leukemia in southern india. Indian J Hematol Blood Transfus. 2012;28(1):37–41. J-Q Mi, Wang X, Yao Y, et al. Newly diagnosed acute lymphoblastic leukemia in China (II): prognosis related to genetic abnormalities in a series of 1091 cases. Leukemia. 2012;26(7):1507–1516. ©2018 Guru et al. This is an open access article distributed under the terms of the Creative Commons Attribution License , which permits unrestricted use, distribution, and build upon your work non-commercially.